But that day, I had to have a burger. My husband shrugged and suggested the little burger place run by the Fontaine Hotel on the promenade of the main canal. It’s a total dive, and I mean that in the best possible way. Dark, with very little seating at a scarred, wooden bar, tattooed and colorful characters man the grill and ferry food about in the open kitchen. The menu is a mix of American favorites: burgers, hot dogs, chinese stirfries and mexican burritos, with a bit of pizza thrown in for good measure. I never did try their other offerings, but I can attest that they grill their burgers with a splash of soy sauce over the thin patties, serving them up with thick slices of tomato and lettuce. And of course, you have to have fries with a burger. These were shoestring, fried crisp and tender before being tossed with seasoned salt, dumped out onto a little tray and loaded down with a thick garlic sauce. This garlic sauce made everything better. The burger was good, but the fries with that sauce were divine. We wound up having garlic sauce cravings and went back again before we left Liepāja for more. Suddenly, my old fry sauce stand-by was boring. How could I have gone all these years dunking into the same old sauce and never even thinking about one of my all-time favorite foods’ ability to make just about anything better? Unfortunately, chives are expensive during the winter and my attempt to grow them fizzled out when our kitten decided seedlings made great snacks and the dirt was fun to dig around in. (The basil only narrowly survived and the aloe vera was a dead loss.) The local groceries weren’t much better, so we remained sadly sauceless while we waited for the farmer’s markets to open. We did find one seller offering them, though they almost seem like she just chopped off young green onion shoots by mistake. 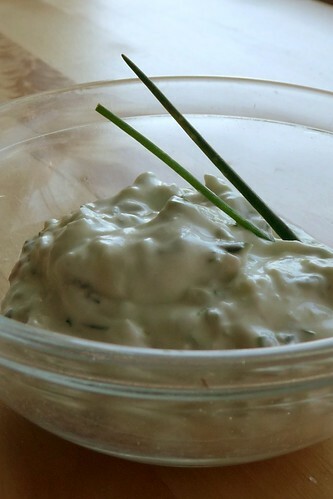 At last, it was time to make our own garlic sauce. Garlic sauce, good for what ails you. This sauce is far better than the Fontaine’s, is not for the garlic-faint-of-heart nor for vampires, and should really be stored in small containers to prevent oneself from accidentally consuming the entire batch. Best on potatoes, burgers, veggies and anything else that can act as a sauce substrate. Pan-roast the head of garlic. To do this, smash the head with your palm or the flat of a large knife to crush the head and break it apart. Do not skin the cloves but remove any of the loose white papery skins hanging about. Place a medium to small cast iron skillet on medium heat and dump all the cloves in. Shuffle them around periodically so they don’t burn, though they will probably blacken in spots. It’ll take about 10 – 15 minutes to roast them completely. Using a mini food processor, mince the roasted garlic, raw garlic and chives. Remove to a small bowl and stir together with mayo and sour cream. The resulting sauce should be very garlicky and kept in the fridge until ready to serve. 1. Please, do yourself a favor and read the label on the sour cream. You want the real stuff, the good stuff, the stuff with just cream listed as an ingredient. I recommend Daisy Sour Cream, my favorite fantastic sour cream. 2. For that matter, read the label on the mayo too. Get the good stuff or, better yet, make your own. Your taste buds will thank you, I promise. This entry was posted in american, gluten-free, latvian, recipes, sauce, untranslated. Bookmark the permalink. Hmm. Unfortunately, my husband can’t recall having a dish similar to what you describe. It could be due to a regional difference – he (and most of his extended family) is from Kurzeme. However, I also can’t find any mention of it in any of my Latvian cookbooks, so I fear it may not be a traditional Latvian recipe. I did a search (for “saldās rīsu bumbiņas”) and found this: Saldās mannas bumbiņas. It uses semolina instead of rice, but it’s possible that with adapting it for rice, it might be close to what you’re looking for. You didn’t say in your comment whether or not you speak Latvian. If you need help reading the linked recipe, please let me know and I will translate it.